This horizontal plastic gourd was designed and developed by Andrew Troyer of Conneautville, Pa. It features the crescent shaped entrance hole in the end of the neck. Again, there is no prep to this gourd and is ready to hang when it arrives at your purple martin site. As seen in the photo, the Troyer Horizontal Gourd has just the right proportions to allow the birds all the freedom to rear a full brood of young with ease. And, the young in turn will have all the room they need to stretch out. 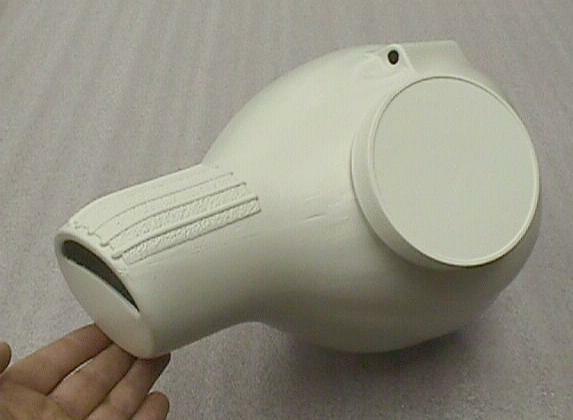 The construction is one-piece, blow-molded with a 4" diameter molded-in, threaded access port. The gourd is 14" long and 9" in diameter at the bulb. 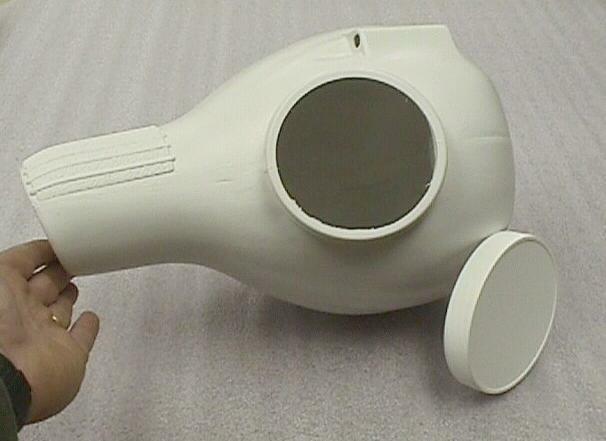 It has 4 - 5/16" drainage holes in the bottom and having a one-piece body, there are no seams to potentially leak. On top of the gourd is a molded in hanging port to pass your wire through or a 3/8" diameter rod to hang it from. Being horizontal, the neck now becomes the entrance for the birds and contains a molded in Crescent shaped Starling Resistant Entrance Hole with a built in 2" tall tail support for easy entry. In the rear of the gourd are two small canopies under which the landlord can drill two 3/8" diameter vent holes if he so desires. Being horizontal, the gourd possesses nearly 14" of depth placing the birds well out of the reach of just about any climbing predator. As has been stated by just about every authority on purple martins, the color of any purple martin housing should be white. The Troyer Horizontal Gourd is manufactured in a white (sun reflecting), high-density polyethylene plastic, with ultraviolet inhibitors added for long life. Since the color in molded in, there is no need to paint it, and the white reflects heat, thus helping keep the inhabitants cooler. The Troyer Horizontal Gourd weighs approximately 21.4 ounces and it's sturdy construction should last for many years of martin habitation. The Troyer Horizontal Gourd has an access port molded directly onto the side of it. This access port is covered by a standard 120mm threaded cap. This port is 4" in diameter, large enough to admit a human hand even while holding a fat nestling or a handful of pine straw or wheat straw. The cap has a liner that renders it and the access port totally watertight when in place. A landlord merely twists the cap off to do nest checks, nest replacement or end-of-season cleanouts. The access port has a high degree of viewing angle, giving easy viewing of nest contents during nest checks. The Troyer Horizontal Gourd looks just like a real (natural) gourd hung horizontally on a rack arm. It's shape leaves no question in the mind that this is a gourd. The features are softly blended together giving a gentle transition of shape without any sharp edges or points for the adult birds, their young or the landlord to get hurt on. 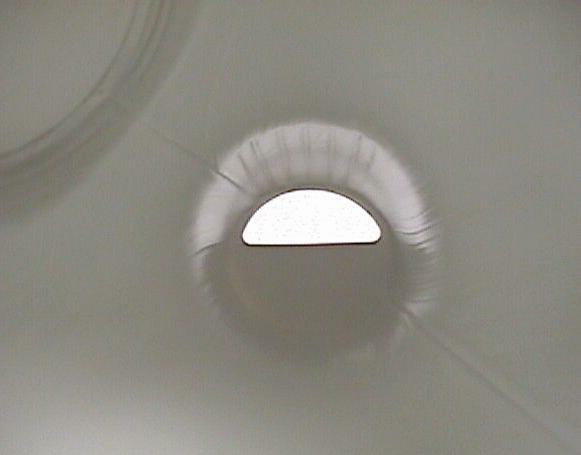 Below is a bird's eye view of what the birds are seeing from the inside of the gourd. Lots of distance from any potential predators. Easy access. Plenty of room for a hand in the 4" access hole.